^ OCLC Classify. classify.oclc.org. [22 May 2017]. ^ Aaronovitch, David. 1984: George Orwell's road to dystopia. BBC News Magazine (United Kingdom: The BBC). 8 February 2013 [8 February 2013]. ^ "Nineteen Eighty-Four," pg 272. ^ 8.0 8.1 Drabble, Margaret. The Oxford companion to English literature 6th. Oxford: Oxford University Press. 2000: 726. ISBN 0198662440. OCLC 925316343 （英语）. ^ 9.0 9.1 9.2 9.3 9.4 9.5 9.6 9.7 9.8 9.9 "Nineteen Eighty-Four"
^ Nineteen Eighty-Four. 國際電影評論網站. [2010-07-30] （英语）. ^ 14.0 14.1 BBC News. 1984: George Orwell's road to dystopia. bbc.co.uk. 2013-02-08. 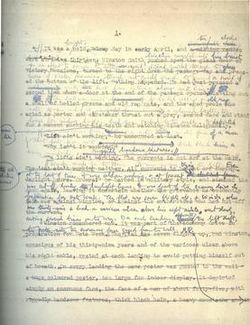 ^ Charles' George Orwell Links. Netcharles.com. [4 July 2011]. （原始内容存档于2011年7月18日）. ^ "Freedom and Happiness"（a review of We by Yevgeny Zamyatin）by Orwell, The Express Tribune, 4 January 1946. ^ 1984, de Orwell, 60 años después – 25.07.2009 – lanacion.com. Lanacion.com.ar. 25 July 2009 [20 June 2014]. ^ 喬治·歐威爾. 一九八四. 邱素慧、張靖之譯 2009年6月第1版. 台北: 印刻文學生活雜誌. ISBN 978-986-6377-00-6 （中文（台灣）‎）. ^ Reed, Kit. Barron's Booknotes-1984 by George Orwell. Barron's Educational Series. 1985 [2 July 2009]. ^ Lines 29–35, page 229, Chapter X, Part II of the Penguin paperback edition of 1984: "The proles were immortal, you could not doubt it when you looked at that valiant figure in the yard. In the end their awakening would come. And until that happened, though it might be a thousand years, they would stay alive against all the odds, like birds, passing on from body to body the vitality which the Party did not share and could not kill." ^ George Orwell: "Notes on Nationalism". Resort.com. May 1945 [25 March 2010]. ^ Allie Walker. New Design for Orwell's Nineteen Eighty-Four. psfk.com. 2013-01-04. ^ Brad Stone. Amazon Erases Orwell Books From Kindle. New York Times. 2009-01-07. ^ Howe, Irving. 1984 Revisited: Totalitarianism In Our Century. New York: Harper Row. 1983. ISBN 0-06-080660-5. ^ Tim Clifford, Katherine Schulten, Amanda Christy Brown. Teaching Orwell and ’1984’ With The Times. New York Times. 2013-04-02. ^ 59.0 59.1 59.2 59.3 59.4 Gwyneth Roberts. Introduction: George Orwell’s life. orwell.ru. [2017-06-27]. ^ Benstead, James (26 June 2005). "Hope Begins in the Dark: Re-reading Nineteen Eighty-Four" 互联网档案馆的存檔，存档日期2005-10-24..
^ Andrew Milner: Locating Science Fiction. Liverpool F.C. : Liverpool University Press, 2012, pp. 120–135. ^ Tzouliadis, Tim. The Forsaken: An American Tragedy in Stalin's Russia. New York: Penguin Press. 2008: 48–49. ISBN 978-1-59420-168-4. ^ Vertov, Dziga. Kino-Eye: The Writings of Dziga Vertov. University of California Press. 1985. ISBN 978-0-520-05630-5. ^ Senyonovna, Eugenia. Journey into the Whirlwind. New York: Harcourt, Brace & World, Inc. 1967. ^ Hitchens, Christopher. Why Orwell Matters. Basic Books. 2003. ISBN 9780465030507. ^ 71.0 71.1 Fitzpatrick, Sheila. Everyday Stalinism. New York: Oxford University Press. 1999. ISBN 0-19-505001-0. ^ Reznikov, Andrej. George Orwell's Theory of Language. Universe. 2001. ISBN 9781469715988. ^ Go No More a-Rushing (Riddle Song). Sniff.numachi.com. [2 January 2012]. ^ Newseum: The Commissar Vanishes. [19 July 2008]. ^ Thank You, Comrade Stalin! : Soviet Public Culture from Revolution to Cold War. ^ The Rise and Fall of the Soviet Union. ^ King, David. The Commissar Vanishes: The Falsification of Photographs and Art in Stalin's Russia. Metropolitan / Holt. 1997. ISBN 0-8050-5294-1. ^ Schacter, Daniel L.; Scarry, Elaine (编). Memory, Brain, and Belief（Mind/Brain/Behavior Initiative）. Cambridge, Massachusetts: Harvard University Press. 2001. ISBN 978-0-674-00719-2. ^ Stalin, Joseph. On the Great Patriotic War of the Soviet Union. Moscow: Foreign Languages Press. 1944. ^ Order of the Day, No. 130, May 1st, 1942. [14 December 2011]. ^ Stalin, Joseph. On the Great Patriotic War of the Soviet Union. FOREIGN LANGUAGE PRESS– PEKING. 1970. ^ Twentieth-century Spanish American Literature to 1960. ^ 84.0 84.1 84.2 "First Bites: Nineteen Eighty-Four. Nigel Fountain, The Guardian, June 14, 1994. ^ Lewis, Clive Staple. On Stories: And Other Essays on Literature. George Orwell. Harcourt. 1966: 101. ^ Ingle, Stephen. The Social And Political Thought of George Orwell: A Reassessment. Routledge. 2006. ISBN 9780415357357. ^ Keyes, Ralph. I Love It When You Talk Retro. St Martins. 2009: 222. Aubrey, Crispin; Chilton, Paul Anthony. Nineteen Eighty-Four in 1984: Autonomy, Control & Communication. London: Comedia. 1983. ISBN 0-906890-42-X. Gleason, Abbott; Goldsmith, Jack; Nussbaum, Martha C. On "Nineteen Eighty-Four": Orwell and Our Future. Princeton University Press. 2010. ISBN 9781400826643.